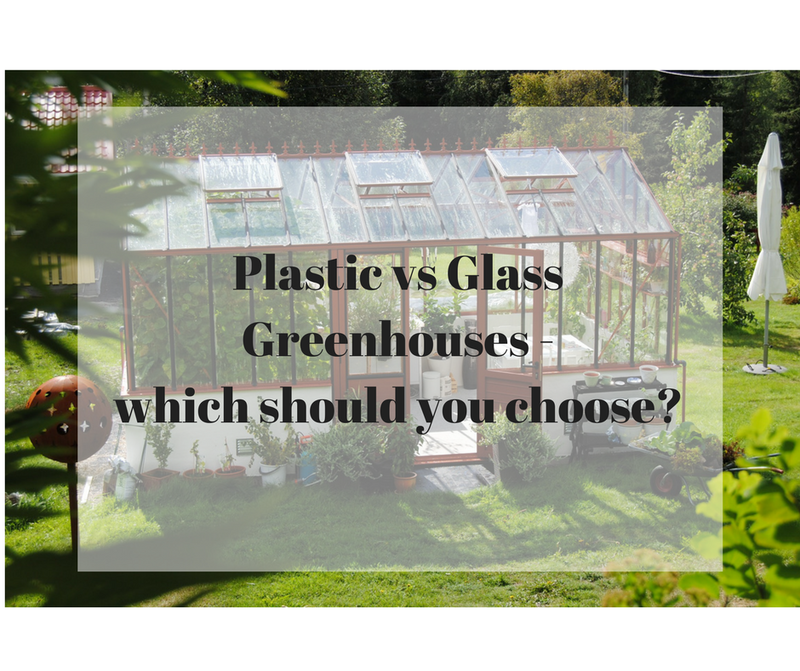 Plastic vs Glass Greenhouses - which should you choose? Greenhouses are perfect garden furniture for horticulturists as they allow them to make the most of the seasons, experiment with growing more exotic plants and grow more tender vegetables such as cucumbers, peppers and tomatoes. There is a range of different glazing options for greenhouses and they all have advantages and disadvantages when compared. The right glazing for your greenhouse will be determined by your requirements, personal preferences, climate and budget. With gardeners keen to grow their own produce in their backyards, greenhouses remain in high demand. Customers first face two choices when they decide that they would like a greenhouse – to build or to buy. Although buying a ready-built greenhouse can save time and energy, purchasing the parts from a supplier and assembling it yourself could save you hundreds of pounds. If this sort of DIY is not up your street, alternatively, you can buy one from a garden retailer. Gardeners who greatly value the aesthetics of their garden tend to go for glass greenhouses as it gives the ‘traditional’ look. Research by gardeners at The Telegraph found that, compared to twin-wall polycarbonate sheets, glass had a 2-3% higher light transmission. However, this is because the light scatters as it passes through the twin-wall and manages to reach areas that light penetrating through glass cannot which could be advantageous. One negative of glass is durability. If your greenhouse is in the flight path of any birds or footballs, you could find yourself replacing the panes regularly. Glass is very fragile as a material and can become damaged off a small bump. There are many advantages of introducing polycarbonate panes to your greenhouse. Some polycarbonate sheets, like the ones sold by The Plastic People, were found to be 200x stronger than glass yet half of its weight. This makes the material easier to use and more durable. Due to its hardwearing properties, polycarbonate does not need replacing as much as glass and has been found to be a longer lasting alternative for traditional glass panes. Upon testing (vigorously with a hammer), the plastic sheets were found to be shatter-resistant which is perfect for any mishaps that may occur in assembly or in the garden. Polycarbonate sheets also filter out nearly all the harmful UV rays that you may become exposed to when gardening in the greenhouse, allowing you to harvest your crop without the fear of sunburn. If thermal insulation is important to you and key to the growth of your plants, glass is the slightly favourable option. A single sheet of polycarbonate has 0.1 less ‘R’ value (measurement of thermal insulation) than a sheet of horticultural glass. However, this can be solved with a twin-wall polycarbonate panel which assists with useful light diffusion as mentioned. If twin-wall polycarbonate is your panel of choice, it must be sealed properly as the flutes within the wall can attract moisture, mould and insects – proper assembly would prevent this from occurring. At one time, a negative property of polycarbonate sheets was clouding over time. However, technological advancements have prevented this from occurring and the sheets remain clear all year round. So, it appears that polycarbonate sheets could be the new glass when it comes to greenhouse panes. Boasting durability, shatter resistance and light diffusion in all the right places, it is ready to take on any challenge that the UK weather has to offer.